The web is crowded with lots of applications and the number is increasing every day. When the issue of validation of these applications arises, testing them is the only feasible solution for it. Testing applications isn’t a mundane task as many think and it has a lot of power to bring more quality, reliability, and authenticity to the application. A good test can pick out any glitches, shortcomings in the frontend from a user’s perspective and it also helps to further add value to the developmental process. Manual Testing isn’t feasible to perform all these steps and hence Automated Testing helps to check a lot of problems and solve major challenges. While testing, the tests have to be performed and checked on different device types, configurations, operating systems, orientations, browsers, and device sizes. To avoid testing on all these different types of devices before a release, an emulator is generally used. Emulators are used to providing a real-time environment without considering all the differences in the device but it is a time-consuming task and have to be performed manually and that’s where automated testing helps to simplify the tasks. Selenium, as an open source testing platform, provides free automated testing features that cater to a majority of selenium testing services and it reduces the time one needs to spend on testing. It can run multiple parallel tests from different devices from various parts of the world efficiently without any deeper knowledge of coding and computation. Therefore, it greatly contributes to increasing the efficiency of the testing operations. When considering running automated tests on mobile web applications, Selenium WebDriver acts as a basis for the frameworks that are built over it. There are two main frameworks based on Selenium that facilitates running tests on mobile web applications: Selendroid and Appium. 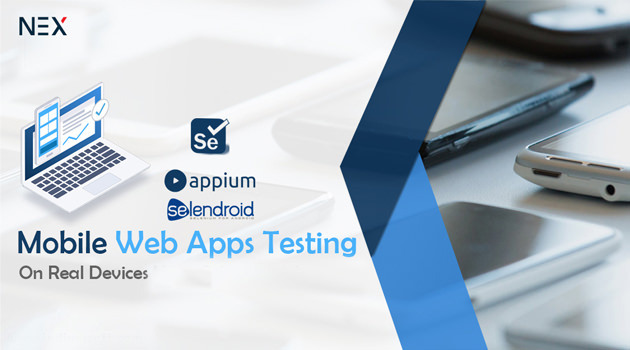 Both Selendroid and Appium are capable of performing a smooth test run that can be capably handled by those who have a bit of background in working Selenium testing tools earlier. Selendroid is an automated testing framework tool that can interact with multiple devices simultaneously. It can be used to test native and hybrid mobile applications as well as web-based mobile applications too. Selendroid can be integrated along with Selenium Grid and use it to run multiple parallel tests. This framework tool can be used to test on a real-time device and also on emulators. Before one starts working with Selendroid, one need to know the basic of programming like Java and have some testing experience with various integrated tools. Also, it is important that one must know how to use Selenium. Under Selendroid’s architecture, the Selendroid server is in two-way communication with the application that is being tested. The tests are written in Selenium WebDriver client API. From the web driver client, a request is sent by using JSON to the Selendroid driver, and it further sends a request in the form of HTTP to the Selendroid’s server which is compatible with JSON Wire Protocol. Selendroid supports web driver in multiple languages such as Java, C#, and Perl and it works on all versions of Android devices. One of the important features of Selendroid is ‘hot-plugging’, meaning hardware devices can be plugged or unplugged during tests without restarting or stopping the testing all the while recognizing new devices automatically. Appium is one of the popular cross-platform mobile testing framework tools for native, hybrid and mobile web applications. It can be used in both Android and iOS devices. One can easily build a testing script and use it across multiple test scenarios. Appium uses JSON Wire Protocol internally to interact with iOS and Android apps using Selenium’s WebDriver. According to Appium architecture, the WebDriver sends a request from the test script to the Appium broker which then configures the project through the server. Appium server starts the testing on the connected devices as it receives the request from the server. Generally, Appium reads the test code from the server in Java. Appium provides a clean API with a seamless, clutter-free experience. Those who have previously worked on Selenium will not have any trouble in testing through Appium. Testing web-based mobile applications have been simplified using the basic framework of Selenium WebDriver. The performance of the applications along with the user interface is also inclusive in the Selenium automated testing and is further simplified due to its scalability and compatibility with different devices and various programming languages for creating test scripts. One can pre-build the test cases for a particular web application and use the same case across different Selenium platforms seamlessly and get benchmarked results from the tests.